Working as a consultant in the Writing and Design Lab is preparing English major Mary Pollard for a career in teaching secondary-school students. Mary did not have intentions on attending Rutgers while in high school; she did not want to follow the same path as her brother who is an alumnus of the college. However, it was the best choice for her financially and its location served to her benefit. When entering freshman year, she thought her college life would be pretty normal: commuting back and forth to Camden, focusing on her studies, and making a few new friends each semester. But things had started on an interesting note. Growing up in Cherry Hill, New Jersey, Mary, African-American, was one of the few minorities in her high school and class. Her first semester at Rutgers–Camden came as a culture shock for her because of its diversity. “This encouraged me to want to work in diverse settings and develop a diverse mindset. Also, I wanted to help people of color with disadvantaged backgrounds get into higher education.” Her journey began with Rutgers Future Scholars. Through work-study, she had the opportunity to begin working for Rutgers Future Scholars, a civic engagement non-profit organization that provides college preparation to first-generation, low-income middle school students. She started off as a Facilitator, which gave her the responsibility to create and teach academic and social curriculum for eighth, tenth, and twelfth graders. Because she excelled at her work and was dedicated to the job, she was promoted to the position of Lead Ambassador following her junior year. She mentored secondary school students and trained new Lead Ambassadors; created and maintained schedules and meetings; and created mentoring opportunities in schools. Her current position is Program Assistant, which requires her to direct and organize programs of the organization. What she appreciates most about being a part of Rutgers Future Scholars is the ability to work with young students, but her experiences have also prepared her to work as a consultant with the Writing and Design Lab (WDL). The research began as a proposal assignment for the Theory and Practice of Tutoring Writing course. Travis DuBose had encouraged her to continue the research. It consists of tracking three first-generation Rutgers students’ interactions with the Writing and Design Lab. “The goal of this research is to find out what best practices the writing lab can start to use to fully aid first-generation college students in writing courses.” Her work was submitted to and accepted by The Conference on College Composition and Communications, where she will be presenting at their next annual conference this March in Portland, Oregon. As the conference nears, she will continue conducting her research in hopes to gain findings that will support her hypothesis. “I never thought I’d be able to do multiple things I love at once. 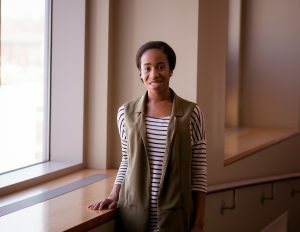 I love to travel and I never knew an English major could do research outside of literature or history.” She will be spending a week in Portland, exploring a new city and developing a network with researchers in different subject areas. Her work itself will make a great impact in the academic field because there are few studies on how writing centers help first-generation students. This page was printed from http://fas.camden.rutgers.edu/2017/03/01/we-r-arts-and-sciences-mary-pollard/ at 5:26 PM Saturday, April 20, 2019.